After getting hit with a boat-load of rain over the course of the last week, it was great to see the arrival of perfect, cool, crisp weather for a pair of weekend long excursions. Each training session was so different, but so much fun. 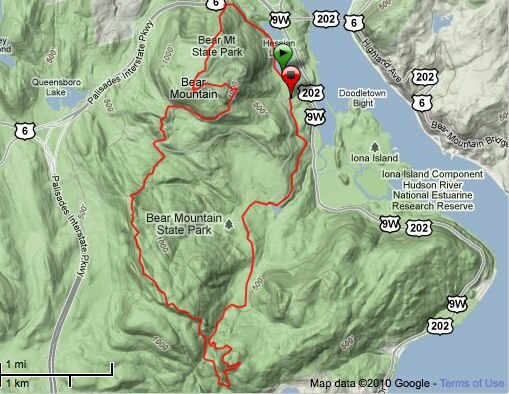 On Saturday, Eric and I headed to Bear Mountain for some serious technical trail work. Oh, and there was quite a bit of climbing as well. 4 hours and nearly 2,800 feet of climbing later, I felt as if I had covered 20 miles (we barely covered 12!). By the time we were finished, my legs were toast from the crazy rock climbing up and the bone jarring descents. Eric has a bunch of pictures posted on his site. Sunday was quite a bit different. 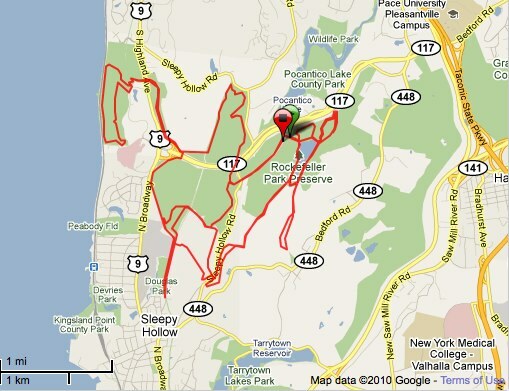 Meeting up with speedy Peter H. at Rockefeller State Park Preserve, we turned a few "slow" initial miles into a nice, swift 22+ mile long run. My legs now have no interest in cooperating with my attempts at moving. I suppose that means I will re-fuel them with some Sunday beer and football. Some like some fun runs. I need to get out that way sometime. I meant to write SOUNDS like some fun runs. I just came home from a long run and my brain isn't working right now. It is too damn hot here and my electrolytes are jacked. ha! This is so fun and adventurous. Want to experience something like this. Great job! More power to you.